Have an affinity for night sky? We do too! We’re hosting an epic out-of-this-world family movie night and you’re invited! Grab this easy Galaxy Popcorn Recipe and host your own Ice Age: Collision Course Movie Night with your family and friends. 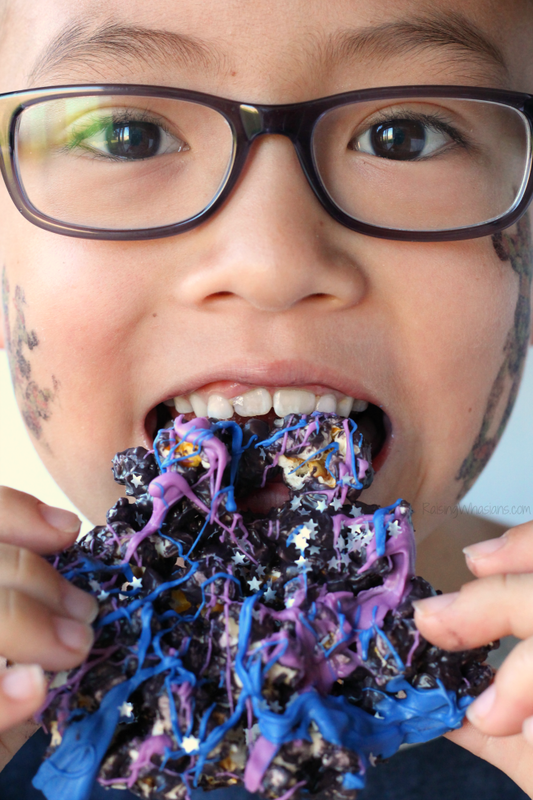 Make an out-of-this-world snack for your next movie night or space themed party! 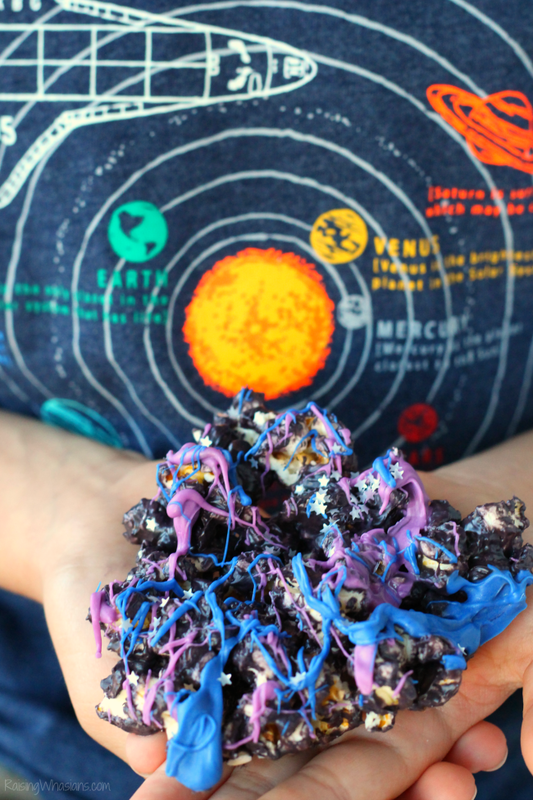 This Galaxy Popcorn is sure to have your guests seeing stars with this easy recipe! Make popcorn according to package instructions. Melt whole bag of black candy melts in microwave according to package instructions. In large bowl, gently combine popcorn and black melted candy until coated. Spread popcorn in a single layer on wax paper lined cookie sheet. Melt ¼ cup of blue candy melts. Drizzle on top of popcorn. Melt ¼ cup of lavender candy melts. Drizzle on top of popcorn. Sprinkle edible stars on top of your popcorn. Refrigerate for 10-15 minutes, or until candy has hardened. Serve immediately or store in airtight container. How fun is this upgraded popcorn snack for your family movie night or galaxy themed party? Your guests will love the sweet and salty combo! 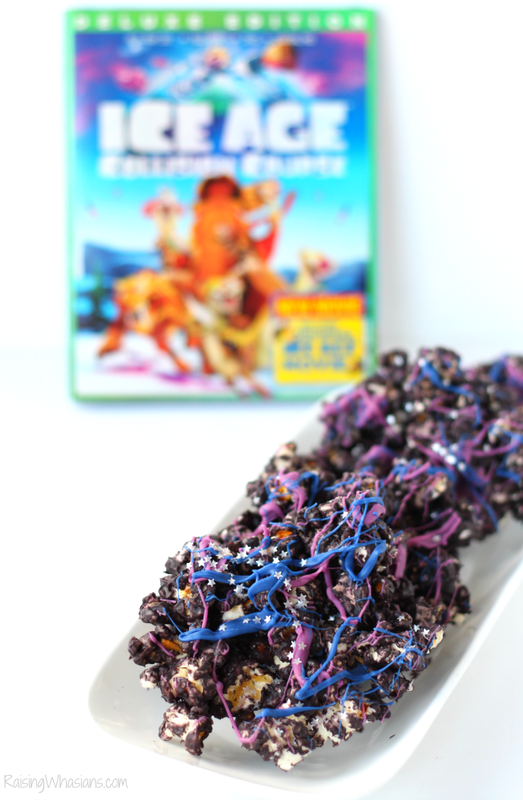 Galaxy popcorn made, we were ready for an epic Ice Age Family Movie Night, featuring Ice Age: Collision Course. 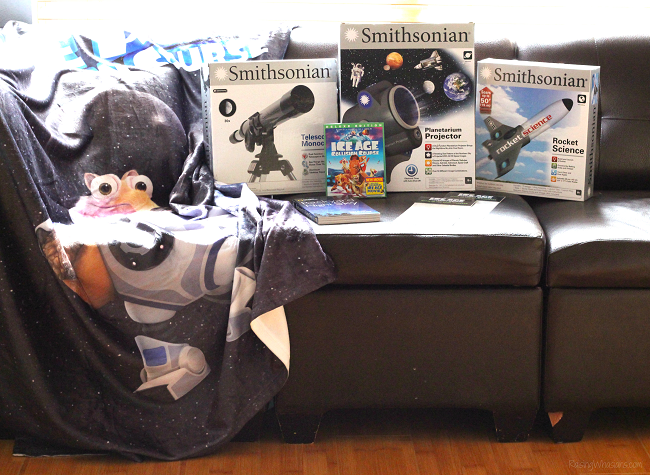 How exciting to receive a full galaxy themed box of fun for our family movie night this past weekend. 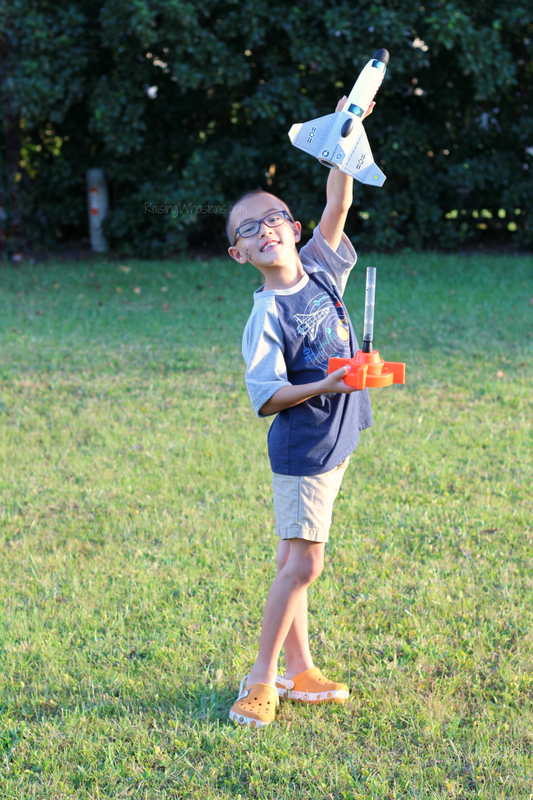 We launched a vinegar & baking soda rocket! We projected the starry night onto our ceiling! We checked out the Super Moon with our new telescope! And most importantly, we grabbed our galaxy popcorn to sit down and watch the new Ice Age: Collision Course movie! The 5th in the series, our favorite Ice Age characters Sid, Manny, Diego and Scrat are all back in yet another epic Ice Age adventure! Featuring Scrat in Space (yes, still chasing that acorn!) and a plan to save the planet from a galactic asteroid crash, your family will laugh and enjoy the newest Ice Age movie again and again! Here’s a fun new video about Ice Age: Collision Course and asteroid belts! 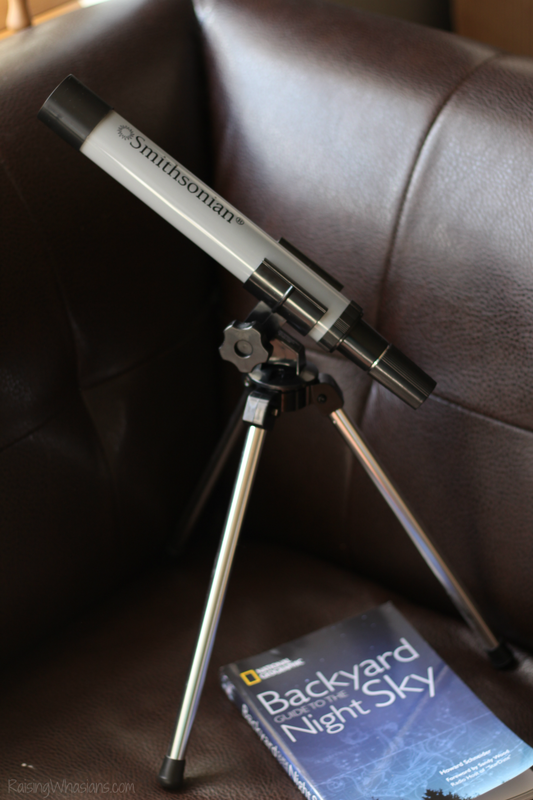 Don’t forget to check out the Scrat: Spaced Out Mini-Movie for extra laughs and lots of fun bonus material. Our family certainly enjoyed our Ice Age themed movie night, complete with Galaxy Popcorn, fun out-of-this-world themed activities and lots of family giggles! 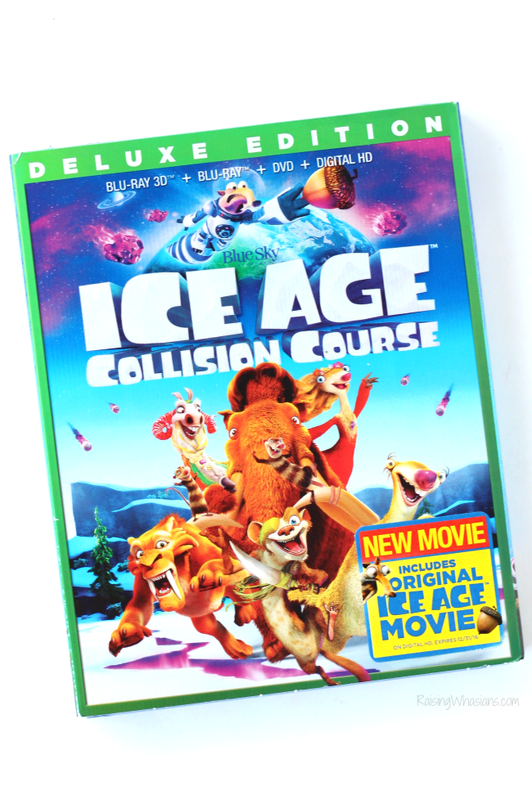 Be sure to look for Ice Age: Collision Course now available on Blu-Ray/DVD and Digital HD. Contest open to U.S. residents only, ages 18 and over. No Purchase Necessary to enter. This giveaway is in no way affiliated with Facebook, Pinterest, Youtube or Twitter. One entrant per household/IP address. This disclosure is made in accordance with the FTC 10 CFR, Part 255 Guides Concerning the Use of Endorsements. Entrants must only enter with either one email address, IP address, and/or Facebook account. Anyone found violating these rules will be disqualified. It is at the sole discretion of the admin of the giveaway if the winner has met the rules or not. Be sure to follow Raising Whasians via Facebook, Twitter, Google, Instagram, Pinterest and YouTube for more of your favorite giveaways! I would give it to my daughter, she loves ice age. We would absolutely try the galaxy popcorn. I love this idea. I would share this with my grandson because he loves the Ice Age movies. I would love to try the Galaxy popcorn. I would share this movie with my children. I would make the Galaxy popcorn. My son!! He adores all the ice age movies and popcorn is his favorite treat!! He’d have a blast making this with me and enjoying it while watching the movie!! I would share this movie with my grandsons because they loved the original Ice Age movie. I’d love to try this popcorn! I’d share this movie with our family because it looks like fun. I might make Galaxy Popcorn. I would share this with my nephews.. I want to make this popcorn this weekend. I would share this with my family. we will enjoy the movie and the popcorn. I would share with my son and he eould love this popcorn. I would not make galaxy popcorn. I would share this movie with my nephew. He saw this movie in theaters and really enjoyed it. Thanks for the giveaway. I would watch this with my 11 year old daughter and my 3 year old granddaughter. Somehow, I think we will be making that popcorn this weekend. I would share this with my son and my nieces and nephew. I’d share it with my Grandkids! I would share with my Grandkids and they would love the popcorn! I want to make it and try also. My nephews and nieces. They just love the previous ice age movies. I would share the movie and popcorn with my granddaughter and hubby — would be a great movie night the next time she comes to stay with us. I would share the movie with my grandson, and I would make the popcorn for him. I would love to share with my family. 2 sons and hubby. We have not seen this this movie, but love the Ice age series. I would watch this with my bestie Steps. I would make that galaxy popcorn because I know in my heart it tastes 100 times better than it looks. I would share both the movie and the popcorn with my daughter & my grandchildren. Love having fun with them! 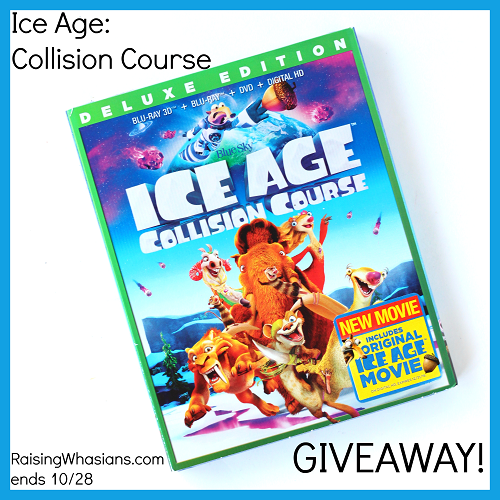 I would love to share this movie with my daughter because we both love Ice Age movies! 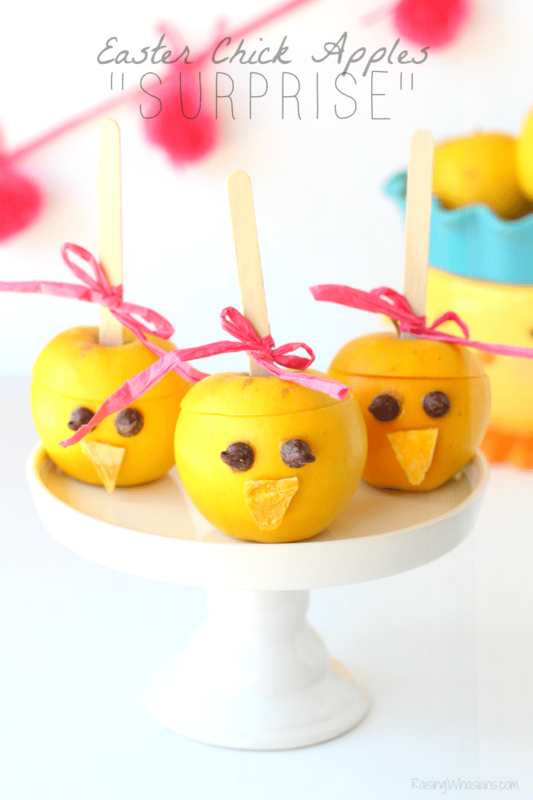 We would love to make this awesome popcorn!! So creative! I’d be sharing with my kidlets! I would watch this movie with my family and have my little niece and nephew over to watch it,We are big fans of all the Ice Age movies. Yes I would definitely make galaxy popcorn with the kids before we watch the movie,it sounds delicious! My grandchildren, they would think this was a hoot! I would share this with my best friend, Jo. We would love to make the galaxy popcorn. I would give it to my kids as a Christmas present and then we would make the awesome galaxy popcorn and watch the movie on winter break. I HAVE to make this popcorn! How cool! I would love to watch this with my daughters and hubby. I would have my 2 nephews over for movie night and share with them. I would share it with my son and daughter. We all love the Ice Age Movies – we especially love Scrat. Id give the movie to my son. We love the Scratt squirrel in those movies!! I would share with my great-nephew Zack and we would make the great galaxy popcorn! I would love to see this movie with my grandkiddies. Yes, I will absolutely try to make the galaxy popcorn! I would share this video with all my grandchildren. You can bet we will try the popcorn. Thanks! I would share this movie with my children. They would absolutely love it! I would share the movie with my daughter because she loves the Ice Age movies but we havent yet seen this one. I am not sure if we would make the galaxy popcorn or not. It looks pretty simple to make though. My son would love to try out this popcorn, and the movie looks like one he would enjoy! I’d love to share this movie and out of this world popcorn recipe with my daughter, 3 nieces, and my nephew! I would love to watch this with my whole family and the galaxy popcorn is so cool I’m going to attempt to make it. I would love to share this movie with my grandson. He would love the popcorn, too. I would love to share this with my grandchildren!! It is the kind of movie I love watching with them! And the popcorn, definitely making and sharing! I would love to make this popcorn!! My kids would enjoy watching this movie! I would share this with my daughter because she loves Ice Age and I’d love to try and make the galaxy popcorn! 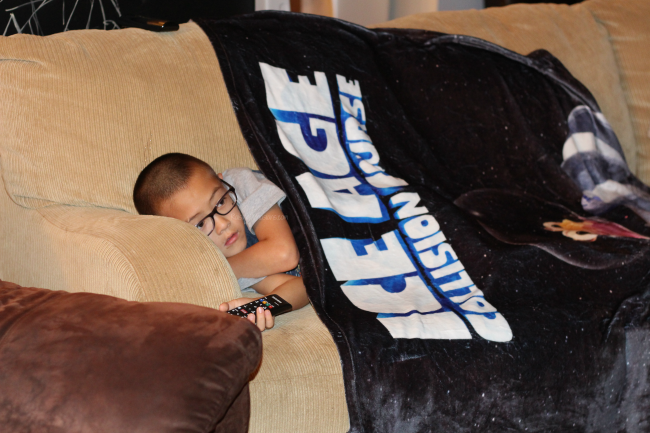 I would share the Ice Age: Collision Course movie with my two boys. They would love it and of course I would try the galaxy popcorn too! I would give this to my 3 youngest kids. It’s a great Family movie. I don’t think I would make the Galaxy Popcorn, because my kids are picky with the way things look. My niece and nephew would love this movie. I would also try to make the popcorn. It looks so cool. My wife loves these movies. I would share it with her. I would definitely try to make the popcorn. I would watch with my kids. Not sure about the galaxy popcorn lol… maybe just regular popcorn. I would love to see the movie with my nephew. The galaxy popcorn looks so cool, I want to make it! Would enjoy this movie with sons, they would enjoy that popcorn. I would share with my daughter and son they would love it no popcorn for us. I’ll watch this with my granddaughters, I think they’ll like making this popcorn. I would watch this with my kids and make the popcorn with them because they would love it. I would love to watch this with my nieces! And we would HAVE to make the galaxy popcorn. It is SO cute! My sister and her kids would get this. I’d love it for my kids. I do want to try it. I would share this with my nephew. I don’t think I’d make the popcorn, though. I would watch this with the kids and we would love to make this popcorn recipe. I would share this movie with my daughter and mom. Yes I would share this with My Grand Kids and we would make the Popcorn!! I would share this with my niece for movie night. I would love to watch this with my son. I would make the popcorn treat too. That popcorn is awesome! I would love to watch this with my grandkids. I would share the movie with my younger cousins. They’d absolutely love it! I would share this movie with my two youngest nephews. We have all enjoyed the previous Ice Age films and I am sure we will enjoy this one too. Of course we will have to make the Galaxy popcorn! Thank you for the fun giveaway. I’m totally making that popcorn! My kids would LOVE it! This will definitely be a family movie night with my daughter and my grandson. 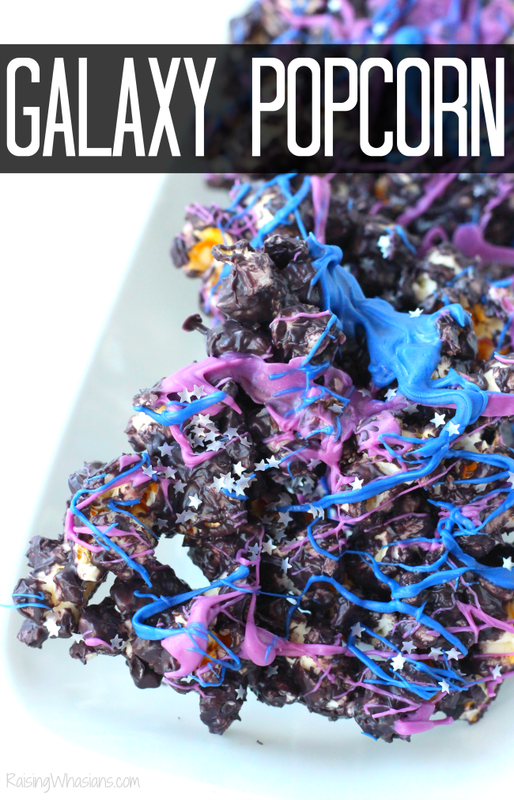 We will most definitely be having galaxy popcorn – I pinned the recipe to be able to find it! Thank you for sharing that! I would share this with my kids & my niece & nephews! I would be making galaxy popcorn! Sounds awesome!! I would watch with my granddaughter and would love to share the popcorn too. I would make the popcorn and share both with my little cousins. This movie would be for all my kids, they have always loved Ice Age, especially Sid. 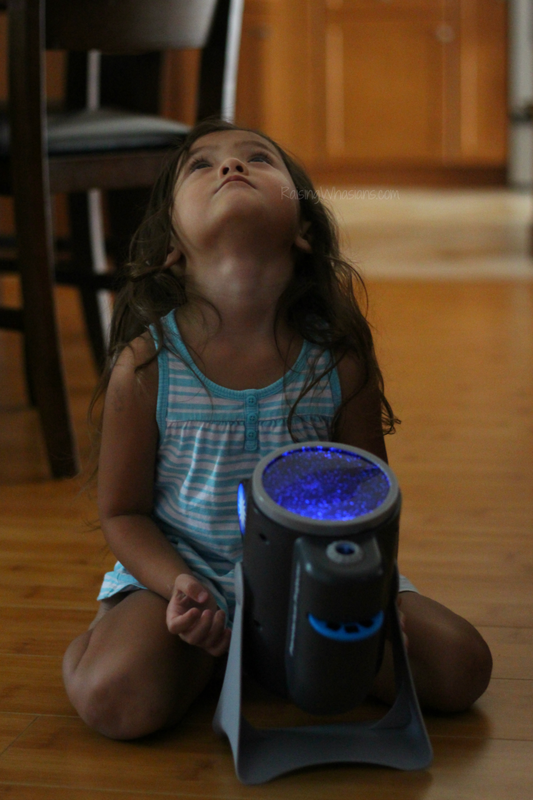 My kids would flip over the galaxy popcorn, it would be perfect for movie night. I would share this with my niece and nephews. We would all enjoy this movie. I am definitely going to make the galaxy popcorn…….I think that it’s super cool. I would share this with my kids since they like Ice Age. I would try this popcorn too. My family would love watching this in our living room! My hubby, my two kids & I would also enjoy that galaxy popcorn! We would watch this movie as a family for movie night because we love the ice age movies and haven’t seen this one yet. Yes, we would definitely make this yummy popcorn to go with the movie. 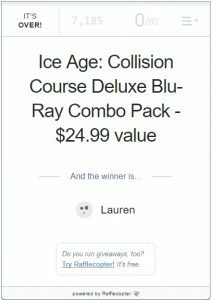 I would share the Ice Age prize package with my nephew because it’d be fun to watch the movie together and let him keep it as a treat. I would share this with my daughter! I think I might make this popcorn! Making Galaxy Popcorn for our 2017 Solar Eclipse Party at work! I made this for my daughter’s Outer Space themed baby shower! It is amazing. We tripled the batch because I had tons of premade popcorn that I got as a gift. The saltiness of the popcorn with the sweet of the candy melt is so good. I used gold stars because of our color theme but I should have stuck with the silver. We like it so much we are going to make it for our Christmas party with white candy melt all over and green and red swirls with holiday shaped cookie candy.